The Sony Xperia Z1(Honami) is one of the flagship smartphones of Sony that provides an entry level premium feel to users smartphone experience. Sony smartphones have been known for their brilliance in display resolutions with their Bravia engines and camera quality with the Exmor RS units. The Sony Xperia Z1 (Honami) definitely falls in the same criteria. Dust and water resistant body, the merger of metal and glass on the body, 3000mAh battery, and a very powerful camera, definitely adds points in its basket. The Sony Xperia Z1 Honami is powered by a Qualcomm Snapdragon 800 MSM8974 chipset, 2.2 Ghz Quad core processor. The 2GB RAM powers the Android 4.3 operating system that runs on the device. The powerful processor and RAM provide a beautiful gaming experience to its users. The Sony Xperia Z1 mobile comes with an internal storage memory of 16GB and can be expanded up to 64GB. The storage options look on the downside as the 20.7 MP camera that the Sony Xperia Z1 (Honami) comes with is bound to click high-resolution images which use up a lot of data. The camera is one of the best features of the Sony Xperia Z1(Honami). It comes with a 20.7 MP primary camera which features, Sony Exmor RS for Mobile Image Sensor, Autofocus, Burst Mode, HDR for Picture and Film, Geo-tagging, Image Stabiliser, Object Tracking, Red-eye Reduction, Scene Recognition, Smile Shutter, Superior Auto, Sweep Panorama and a lot more. The secondary camera is slightly on the downside as it is a 2MP one. The Sony Xperia Z1’s specification of the battery is that it comes with a 3000 mAh battery. This should be sufficient to provide the device with enough juice to sustain it for 14-18 hours on regular usage. The Sony Xperia Z1 review on the design and detail of the body and display is vibrant. The 5-inch screen display fitted on the device produces a display resolution of 1280x720 pixels. This TFT screen produces a display output of 16.7M colors. The design of the Sony Xperia Z1 is very elegant. It is a blend of metal and glass which makes it a treat to the eyes. The Sony Xperia Z1 (Honami) features Gesture Input, Pixel Reproduction, Face Unlock, Color and Contrast Enhancement, Gesture Input, Screenshot Capturing and more. The Sony Xperia Z1 Honami is Sony’s flagship phone in the 5inch premium smartphone segment. 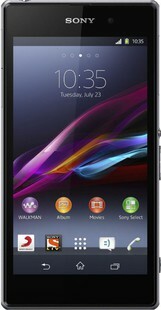 The 5-inch display and the powerful 20.7 MP camera provide the user the Sony experience that they look for. Sony Xperia Z1 (Honami) full specs and reviews as of Apr 2019. Buy it here!